lt;stronggt;RCPA11206lt;/stronggt;lt;BR/gt;Rubbermaid Web Foot Looped-End Wet Mop Headlt;BR/gt;Antimicrobial protection on launderable wet mop inhibits the growth of bacteria that causes odors amp;amp; stains. Balanced blend of cotton and synthetic fibers delivers up to five times the absorbency of cotton mops, while looped-end, open-twist yarn reduces linting. Tailband allows the mop to cover more floor area per stroke, saving time and money. Head Type: Looped-End Application: Floors.lt;BR/gt;lt;BR/gt;lt;stronggt;RCPH216lt;/stronggt;lt;BR/gt;Rubbermaid Web Foot Looped-End Wet Mop Headlt;BR/gt;Plastic jaws firmly grip mop head. Allows quick mop changes. Ideal for 5amp;quot; wide headband mops. Handle Length: 60amp;quot; Handle Diameter: 1 1/8amp;quot;. 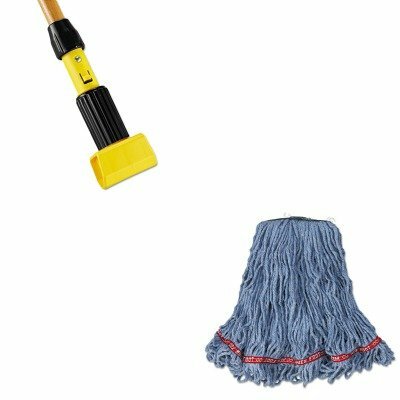 (3 Pack Value Bundle) RCPH124 User-Friendly Mop Handle, Side Gate, 66"